Money is important for them; however the work usually constitutes an implementation of passion and interests for them – even if earnings aren't satisfactory. Wisely manage their expenses, limiting them only to needed things. When they manage to save large sum of money, willingly decide on a larger purchase. They are able to save a lot, if they have some purpose to save up for. 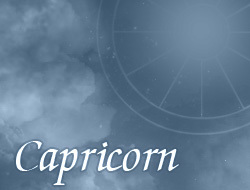 Capricorns are also optimists, who rarely are perturbed with financial difficulties, hoping that the fate will smile to them.